Among the most exciting innovations in the cumulative space of modern music is how technology is impacting music. Guitars in particular are in the receiving end of a few crazy ideas these days, from iPad-powered bodies to contemporary reinventions. The Di Donato from Italy, however, is in a league of its own. An odd mix of timeless craftsmanship and mesmerizing minimalism, the Di Donato is the guitar for our times. The name comes form the two brothers Enrico and Edoardo, both of whom have set about making classical instruments in the past. 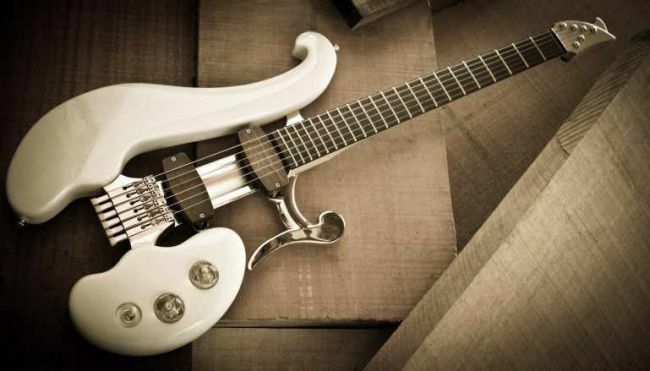 What sets their Di Donato electric guitar apart is its balance of cast aluminum and wood. Indeed, it’s ‘balance’ that matters the most with the Di Donato, which was built with classical sensibilities in mind. The cutting edge part is the aluminum alloy the brothers chose specifically for the guitar’s body. It needed to have the exact tonal qualities that would balance the wood used, be it cedar, mahogany, or maple. As an added bonus, these hand-made, hand-tuned guitars are only available for order. This allows for customer modifications for an optimum playing experience. Thanks to the painstaking artisanship that goes into each guitar, each Di Donato sells for upwards of $5,000.